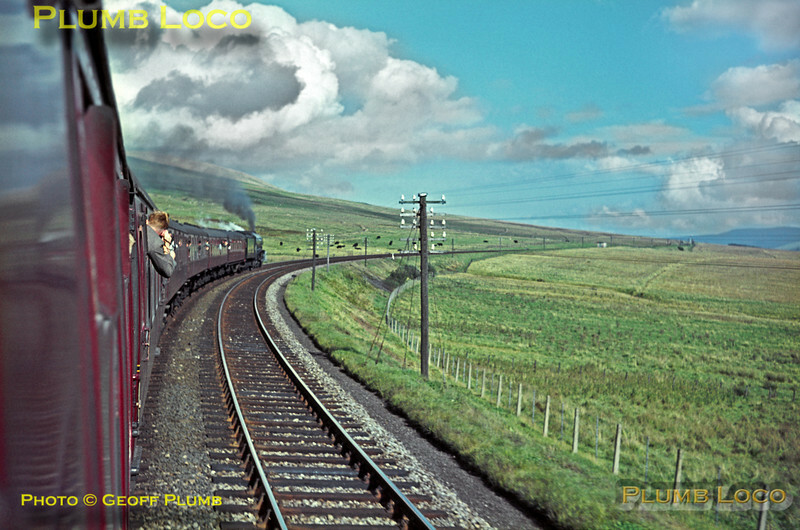 Pictures on former LMS and LNER lines in Scotland, including the East Coast Main Line north of Edinburgh. A few pictures to start with, more to be added as time permits. I made some early visits to Scotland with the RCTS in 1957 and 1960, plus some family holidays, all before I had a camera. I saw some wonderful things and have very happy memories, so I have been lucky enough to fill in some of those gaps with original slides from other photographers, some of whom are sadly now deceased. I'm very grateful that they took the shots! Seen from the train, A4 4-6-2 No. 60007 "Sir Nigel Gresley" is blazing away on the climb to Whitrope summit during its record run over the Waveley route to Hawick, en route from Carlisle to Edinburgh with the RCTS "Scottish Lowlander Railtour" on Saturday 26th September 1964. Slide No. 1069.